What is left out of a product is just as important as what goes in, and the Rootz Energizing-Superfood only contains the cleanest ingredients available. After giving this product a try, you will never want to go back to sugar and chemical filled energy drinks. 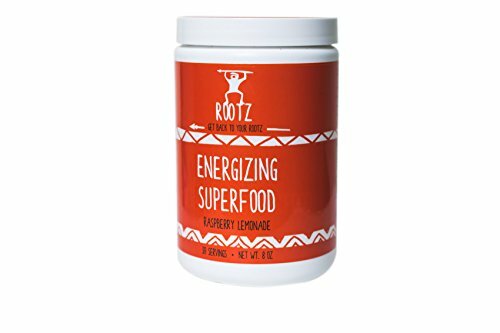 Our Energizing-Superfood is a blend of natural superfoods, plants, and herbs that will give you a non-jittery and focused energy boost any time you need a little pick me up-before exercise, in the middle of the day at work, or even in the morning instead of coffee! The Rootz Energizer is loaded with vitamins and minerals, and contains plant-based energy enhancers that will have you looking, feeling, and performing your absolute best. 100% Paleo approved, Keto friendly energizing-superfood powder made from real, wholesome foods. Gluten free, dairy free, soy free, non-GMO, no sugar added and no artificial ingredients! Plant-based blend of natural herbal energy enhancers and superfoods for a non-jittery boost. Drink instead of your morning coffee, before a workout or as a midday pick me up at work. What to expect: enhanced energy, mental clarity, increased strength and an improved mood. If you have any questions about this product by Rootz, contact us by completing and submitting the form below. If you are looking for a specif part number, please include it with your message.